Although they may not admit it, data show that employers are hesitant to hire people who have disabilities. That’s unfortunate, since having a disability doesn’t necessarily preclude a person from performing well in the workplace. And employers’ failure to recognize that can lead to missed opportunities on both sides. “Many times, the only difference is that workers with disabilities might do things differently, which could mean more efficiently and better than what others have previously done in the position,” notes a recent article from the Society of Human Resource Management (SHRM). Fortunately, the situation may be gradually changing, thanks in part to the ongoing worker shortage. USA Today reports that people with disabilities made up 3.2 percent of the American workforce last year, up from a range of 2.9 to 3.1 percent between 2011 and 2016. Other benefits of hiring people with disabilities may include enhanced staff morale and better overall diversity. Eligible businesses may also receive tax credits or deductions for hiring and enabling such workers. In some cases having employees with disabilities also increases a firm’s chances of securing government contracts. What are some of the barriers to employing persons with a disability? Among them are these two common myths shared by employers. Myth 1: Reasonable accommodations are expensive. In many cases, reports SHRM, such employees just need accommodations that have become routine, such as flexible work schedules, telecommuting options, or restructured workstations. In fact, in one study of U.S. companies employing workers with disabilities, less than half had incurred extra costs, while the remainder had incurred one-time expenses of about $500 each for accommodations. Myth 2: The employer shouldn’t expect job performance of 100 percent. Not true. 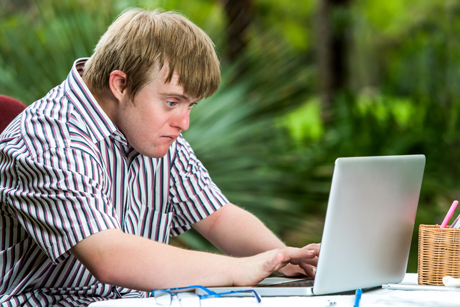 Once reasonable accommodations have been made, the EEOC dictates employees with disabilities must meet the same quantitative and qualitative production standards as those without disabilities. The organization has published a standards guide for clarification. So what can your company do to hire more people with disabilities? It may seek an overview from a counseling organization such as the Job Accommodation Network. Then it could use disability inclusion statements in its job advertisements; attend disability-focused job fairs; post jobs on disability-oriented job boards; pre-install reasonable accommodations, and educate its employees about working with those with disabilities.